Legislators, lobbyists and other interested parties gather under the dome at the State House in Augusta in this Feb. 2, 2016, file photo. 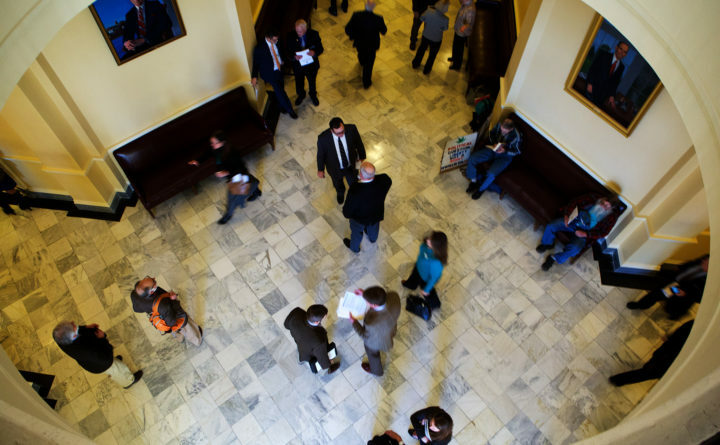 AUGUSTA, Maine — In a cramped room Friday morning at the Maine capitol complex, a few dozen lobbyists learned that perception supersedes intention when it comes to sexual harassment. “I’m not here to tell you you can’t have fun in the workplace, but we have different boundaries today,” Karen Ryla, the counselor leading the presentation, told the group. But many already knew this. The training session, one of several coinciding with the start of the 129th Legislature, is part of a requirement under LD 1842, passed into law last year. It requires all lobbyists, legislators and their staff to be trained on how to recognize and properly handle sexual harassment. The change, which adds lobbyists to the mix, is meant to more explicitly draw a line between what’s professionally appropriate and inappropriate. Though its aim, in part, is to help mitigate a culture in which the lobbyist-legislator power imbalance makes it too easy for sexual harassment to flourish, some lobbyists left Friday’s group session, and the previous one last month, disheartened. One female lobbyist, who asked to remain anonymous because she feared speaking openly could negatively affect her relationship with lawmakers, referred to it as a “boilerplate” how-to that was unhelpful in offering real solutions to inequitable nuances in the lobbyist-legislator relationship that give way to sexual harassment. Others said they had hoped to leave with more concrete ways of dealing with harassment in the moment, beyond being advised to change the subject, to move away from the harasser or to talk about one’s spouse even if they are not married — all of which were suggestions made by Ryla during her presentation. What they received, instead, were “completely lacking” tips that are not actually “viable options for addressing sexual harassment,” another lobbyist said. The training session — the second of five — was revamped this year to be more “interactive,” Grant Pennoyer, executive director of the Legislative Council said. “The session [legislators] used to get was probably a 20-minute overview. Now there’s more of a question and answer,” he said. New legislators were trained separately in December. Ten female lobbyists and legislators, most of whom left their separate training sessions frustrated and unconvinced of its effectiveness, agreed to be interviewed for this story. But most opted not to share their names for publication. Legislators said they don’t want to violate the trust of colleagues. Lobbyists worry that openly criticizing the process could compromise their relationships with legislators, whom they rely on to carry out policy objectives. In a world where approachability is political currency, assertively standing up against sexual harassment is a risky endeavor. The real onus, most said, is on legislators, who have the upper hand. Sen. Shenna Bellows, D-Manchester, accepts that. “That shared understanding by all legislators is an important component of changing culture, rather than focusing on making those who are subject to harassment responsible,” she said. Though training is just one step toward necessary change, “Those of us who are in leadership, we should be setting the right tone,” she said. This isn’t to say only female lobbyists experience sexual harassment, but women in general do. Up to 85 percent of women are subject to workplace sexual harassment, according to the U.S. Equal Employment Opportunity Commission, and the vast majority go unreported, though it is improving. In 2017, when the #metoo movement caught fire nationwide, sexual harassment complaints rose by nearly 12 percent, the organization reported. If sexual harassment is happening in the Maine Legislature — multiple people have confirmed privately and publicly that it is — there is little record of it. In the past decade, only two complaints were filed against lawmakers. Currently there are only clear mechanisms in place for legislators and staff to file complaints, not lobbyists — another criticism many female lobbyists shared. A policy change to address the discrepancy is slated to be considered in the coming weeks by members of the Legislative Council and Personnel Committee, Human Resources Director Jackie Little said. Part of the impetus in mandating training for everyone is to spur dialogue and draw clear standards for what is appropriate, the bill’s sponsor, Senate Majority Leader Nate Libby, D-Lewiston, said. When a legislator manipulates a relationship, “it’s not dissimilar from when a subordinate is feeling harassed [by a boss] and feels in a difficult position to report that,” he said. Bellows suggested a joint meeting for legislators to hear lobbyists’ concerns. No switch has been flipped, everyone agreed. And even though many are critical of what they had hoped would be a more compelling first step, they are still glad it happened. CORRECTION: An earlier version of this report should have stated that two sexual harassment complaints were filed against, not by, lawmakers during the past decade.